After Baton Rouge, Louisiana, suffered inundating rains and widespread, historic flooding, residents have begun the formidable cleanup and rebuilding necessary to bring some normalcy back to their lives. As laborious as these tasks might be, however, the government has no intentions of alleviating stress from the effort: burdensome building permits — essentially, government permission slips — must still be obtained before rebuilding can begin. 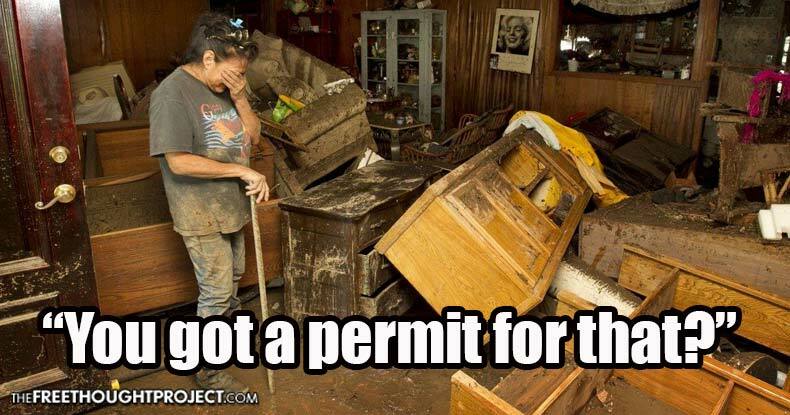 Considering the daunting expense of rebuilding in itself, those State permission slips may make reconstruction cost-prohibitive for some, while others — given the strict regulations pertaining to the floodplain and more — may not be allowed to rebuild on their own property at all. Any homes needing more extensive reconstruction than simply the removal of water-damaged drywall and carpeting — cases where waters reached the level of electrical sockets — will need a full construction permit from the parish government. Fortunately, in a small act of grace pointed out by Reason, fees for reconstruction permits have been waived by local officials — though the permits, themselves, are still mandatory, as permission to repair some of the 20,000 flood-ravaged buildings in East Baton Rouge might not be given at all. That could be an issue in more than one way. As noted by the Advocate, the housing market in Baton Rouge had been experiencing a shortage before the massive flood. Thus, anyone unable to afford reconstruction — or who won’t be granted permission to rebuild on their property — may have a difficult time uprooting and relocating in the same city. Prior to the flood, rental property inquiries comprised just 3 to 5 percent of traffic to one real estate company’s website — after the flood waters receded, the number jumped to 84 percent as people search for temporary shelter while property is fixed or permanent relocation plans can be made. Damage from the floods that left at least 13 people dead, in the Baton Rouge area, alone, is astronomical — and will be difficult to fully assess for some time. According to the Baton Rouge Area Chamber, 31 percent of homes — more than 110,000 residences — in nine parishes are located in areas having been subject to flooding, affecting at least 280,910 residents. Total estimated value of flooded homes exceeds $20.5 billion — and though that tally is property value, it doesn’t account for personal belongings, vehicles, and other possessions. Just 15 percent of residential property owners had insurance against flooding. In East Baton Rouge, nearly 33,000 residential units experienced flooding — encompassing 16.9 percent of the total units in the parish. Over 7,300 businesses employing around 18 percent of area employees experienced flooding, as well. Another impediment to rebuilding will be structural elevation requirements. Those not at least one foot above federal government designated flood zones must either be rebuilt to meet standards, or will be razed and occupants moved to higher ground. However, even those strictures come with a major caveat — and quite the catch for residents in need of Federal Emergency Management Agency grant money. As the Wall Street Journal noted, homeowners in need of federal funding for reconstruction may be required to meet federal flood standards designated by President Obama in an Executive Order last year — which are a full foot above both previous standards as well as those required for permits in flood-damaged areas. “This is ensuring that when federal investments are made we will rebuild higher and stronger,” said FEMA deputy associate administrator for insurance and mitigation, Roger Wright, quoted by the WSJ. FEMA on Monday proposed the change be mandated in order for residents to receive federal funding. Whatever possible laudable intent Obama and FEMA might claim with those regulations, the headache and expense for residents and business owners already dealing with colossal flood damage costs is undeniable. Further, the various potentially conflicting rules could create a regulatory conundrum for anyone attempting to rebuild in federally-designated 100-year flood zones. That red tape is quickly piling up for the beleaguered residents of Baton Rouge. With so many regulations, rules, and strictures to meet — just in order to pick up the pieces of shattered lives — whatever intent the government might have to avoid future costs is wholly nullified by its burdensome presence during the flood recovery. It is no wonder the private recovery efforts are dwarfing those of the state. While it might be logical to dictate taxpayer-funded federal grants for rebuilding have some guarantee the new structures won’t be swept away by flooding in the future, as Reason duly noted, designating floodplains is an altogether inexact science — as the Louisiana flood, itself, aptly proved. Obama’s tardy visit to flood-ravaged Louisiana was hardly welcomed by many — his and the federal government’s nit-picky, arbitrary rules, even less so.